The Master Plan was informed by a comprehensive public input process through a variety of outreach efforts. It calls for the repair or replacement of amenities based on the community’s response.It address key infrastructure issues, and it honors the history of the park. The baseball fields will be regraded and have new drainage and irrigation systems installed to increase maintainability and allow greater use during inclement weather. The tennis courts will be rebuilt to meet USTA standards. There will be a fenced, full-court basketball facility, which can be used as a fourth court for tennis tournaments. Two bocce courts with picnic facilities will be added. Millennium Playground (the Dinosaur Park) will be in the same area of the park it currently is, keeping portions of the beloved existing play elements along with the installation of new play structures and equipment. There will be expanded picnic areas in several locations around the park. A pathway (one-third mile long) with benches and shade trees will circle the perimeter of the park. The basketball court and the skate park will be relocated to the Sunny Hills Drive-side of the tennis courts. There will be a new drop-off and parking area at the Sunny Hills Drive entry. The park and its facilities will meet current safety and ADA standards. Phase One involved gathering community input related to current or future uses at the park. This included a series public meetings that addressed the overall park along with a series of meetings that sought to gather detailed information related to specific uses within the park. Phase Two involved a review of proposed conceptual plans. The architects, after collecting and analyzing all of the public input, created several plan options that could meet as many of the expressed needs as possible. 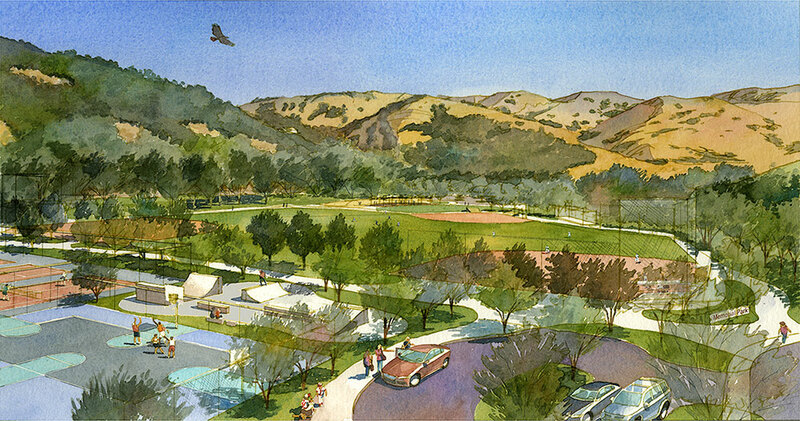 The final, preferred Memorial Park Master Plan was recommended for approval by both the Planning and Parks & Recreation Commission, and was unanimously approved bt the San Anselmo Town Council on February 27, 2018. View the staff report on the Master Plan. Through the implementation of the master plan, Memorial Park can be restored, preserved and enhanced for the enjoyment of all for generations to come. We hope that you will get involved! If you have any questions or if you would like to help as a volunteer, pleases email Director of Community Service Dannielle Mauk at dmauk@townofsananselmo.org.